The bridal party of Esther Couturier poses with the Cedar Springs Fire Department, who came and saved the day for Esther and her groom. Photo by M. Ellick. Some unexpected, but not unwelcome, guests turned up at the wedding of a local graduate last weekend. Esther Couturier, a native of Cedar Springs and a former Red Flannel court member, was marrying her fiancée from Zimbabwe at Pine Lake Campground last weekend, January 16. She had met him on a mission trip to Zimbabwe and many of his family had traveled here for the ceremony. Just before the ceremony was to begin, the Master of Ceremonies lit the fire in the fireplace, but the vent was not completely open, and smoke filled the room, necessitating a visit from the Cedar Springs Fire Department. According to Cedar Springs Fire Chief Marty Fraser, it first came across dispatch as a fire alarm, then that there was smoke in the building. He said they took two engines, and ventilated the building with fans. 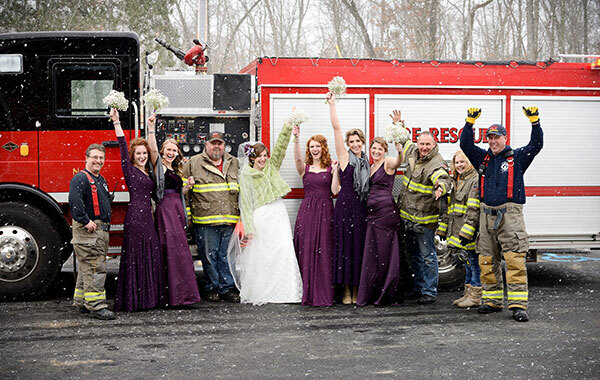 The bridal party joked around with the firefighters and had the photo above taken to commemorate the unusual event. The wedding then went on as planned.